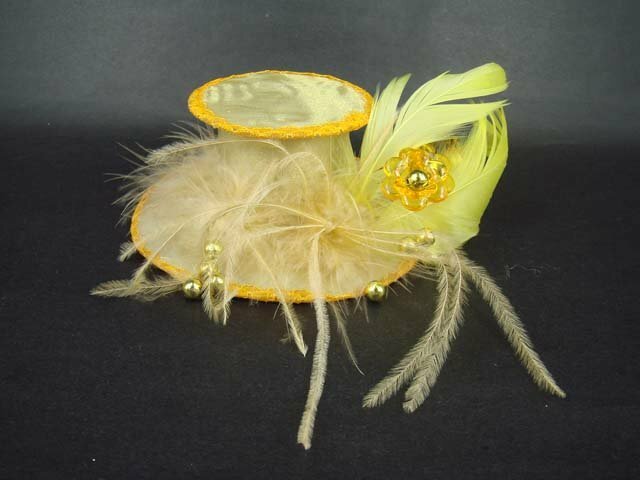 myfreerange Store Wedding lace bead Feather Gold mini hat Fascinator H09 Different fascinators are available in our store. Visit My StoreCondition: Brand New, 100% Feature:It is the perfect accessory for weddings, proms, pageants, or other special occasions. Size: (not included the feather) Approx. 5.2 X 5.2 x 2 inch Quantity: 1 piece Material:High Quality handmade item Size: fits all ladiesCheck out my other items! Be sure to add me to your favorites list! By Pay Pal ~If you would like to post by Hong Kong Registered mail (have tracking number), extra $2 is needed.Thanks. ~Delivery Time : 10 - 20 business days normally but may be sometimes about 24 business days for some countries. ~We will ship to your paypal address. Please make sure it is right.Thank you. ~If you get the wrong item or damage item, please take a picture and send to myfreerange@gmail.com for replacement ~Item must be changed within 14 days because of damage. ~Import duties, taxes and charges are not included in the item price or shipping charges. These charges are the buyer's responsibility. ~Please check with your country's customs office to determine what these additional costs will be prior to looking/buying.~THIS IS NOT A VINTAGE PIECE, BUT VINTAGE STYLE ONLY .A REPRODUCTION USING ALL NEW MATERIALMy Free Range is a store that can provide the good service and product to you. We are understand what you want.~Contact us : we will reply you as soon as possible. If no response for you within 48 hours,please check the spam in your mail box ~Before leaving negative feedback, please contact us. We will try the best to handle all matters.